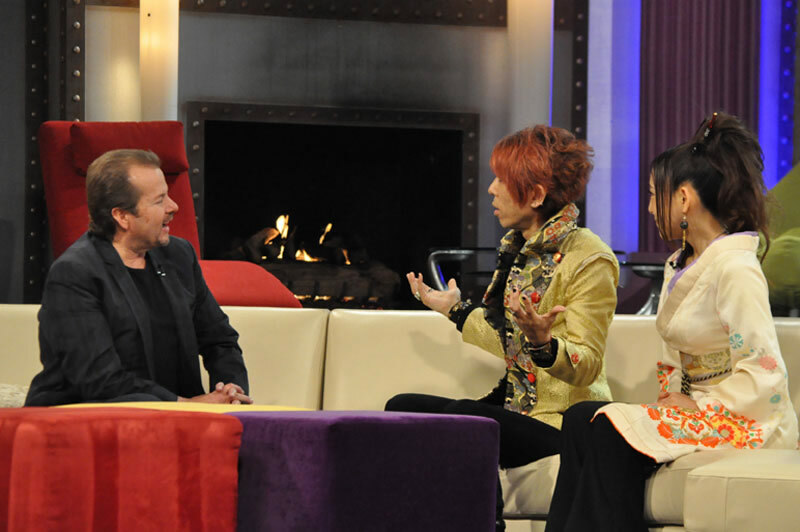 Heavenese's interview at TBN during their L.A. tour was aired on TBN's "First to Know" program. 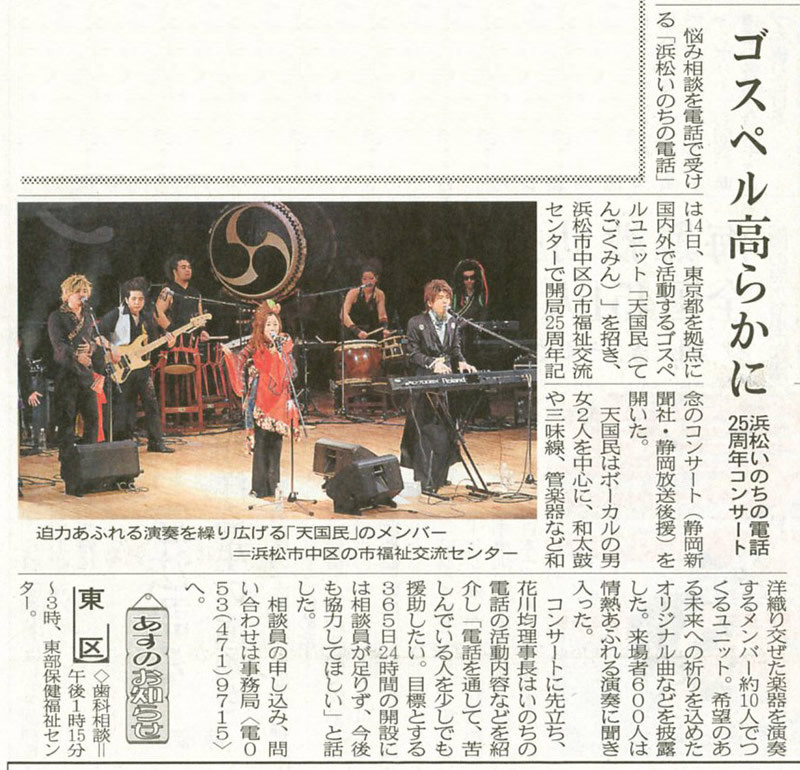 If you saw the interview, please leave a comment on Heavenese's Facebook page. On November 17th, the Consulate-General of Japan in Los Angeles held a celebration to welcome the new Consul General and to celebrate the emperor's birthday. 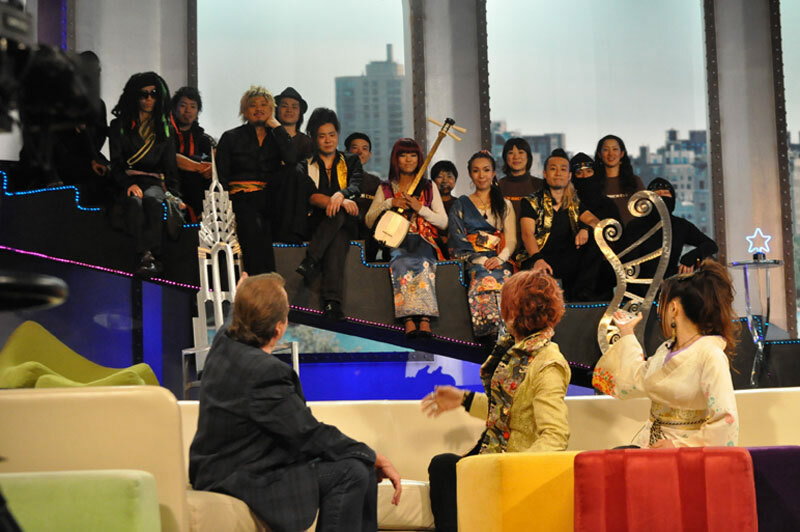 Marre and Kumiko, from Heavenese, were invited to participate in the celebration. The new Consul General asked Marre and Kumiko to sing because he greatly appreciated their involvement with Kick Back Cafe and Heavenese in the relief effort in Rikuzen-Takata. Representing Japan, Marre sang Japan's national anthem, "Kimigayo." 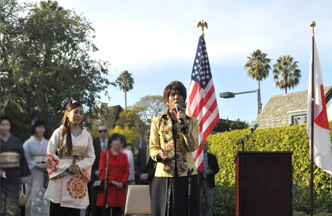 Kumiko sang the U.S.A's national anthem as a token of thanks to the U.S. for all their support. They both received many positive comments concerning their renditions of the anthems. One person said, "Your performances of the national anthems were very remarkable." After the March 11th catastrophe, Marre and Kumiko were in L.A. and shared what was needed in the devastated areas. 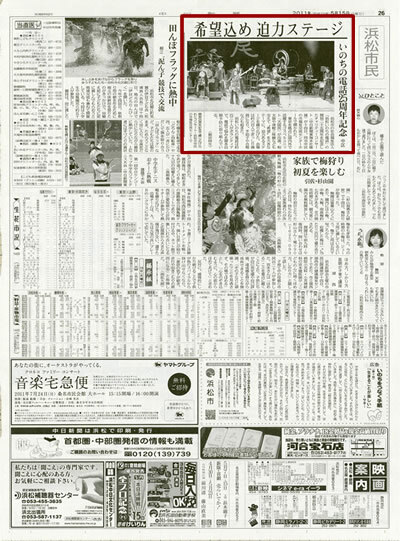 Many Japanese people in L.A. provided money and goods for the relief effort. 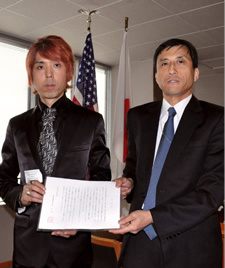 Knowing that Heavenese would be in L.A., the mayor of Rikuzen-Takata, Mr. Toba, had Marre and Kumiko delivered a letter of gratitude to the Consul General, Mr. Niimi. 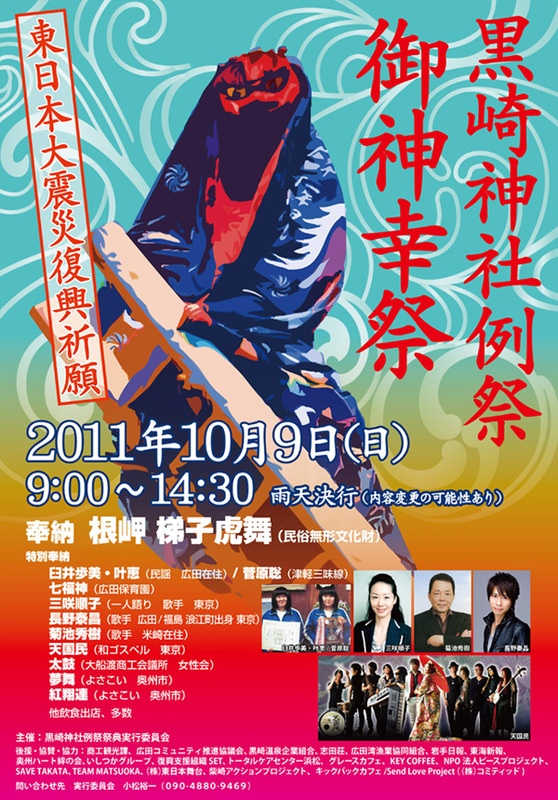 Sunday, October 9, 2011, Heavenese performed at the Offering to God Feast at Kurosaki Shrine in Rikuzen-Takata, Iwate prefecture which is held every four years. 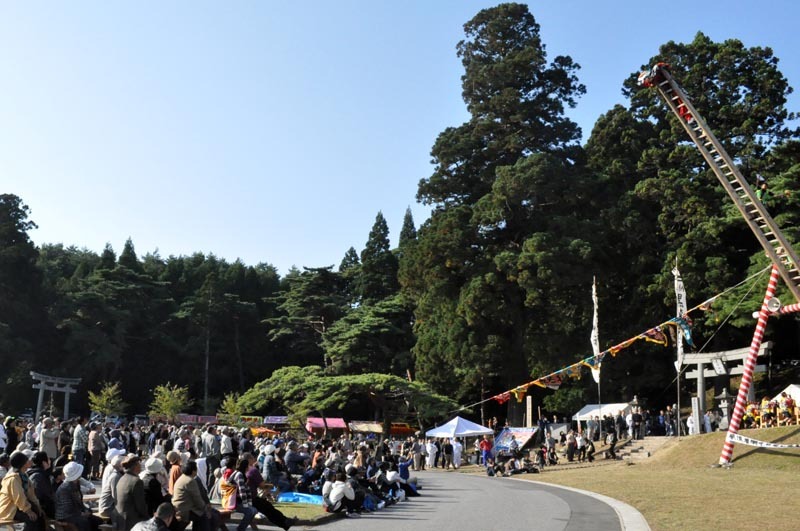 Having lost floats, clothing for feast, and equipment in the tsunami, it was thought that only the shrine rituals would be performed this year and the popular traditional feast events would be excluded. One of the main events in the fesat, Hashigo-Toramai, has been performed over 300 years, and the people who put it on were compelled to do it this year because of the difficulties everyone had been through. This was just another step forward in the rebuilding process. At the feast there were more people than in past years, and we saw the people's desire to rebuild and move on. We are so thankful we had the opportunity to be part of this feast and to offer our sincere prayer to see this area and people restored. A detailed report will be posted soon. ● First in the history!! We were invited by the official representatives of Local Shinto Shire to take part and perform as music offering to God in their upcoming most sacred traditional feast which is being held once in every 4 years. 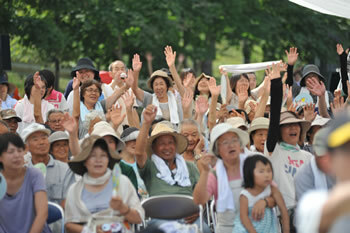 This year it is going to be held to help promote the reconstruction efforts and encourage people of the Rikuzen-Takata. 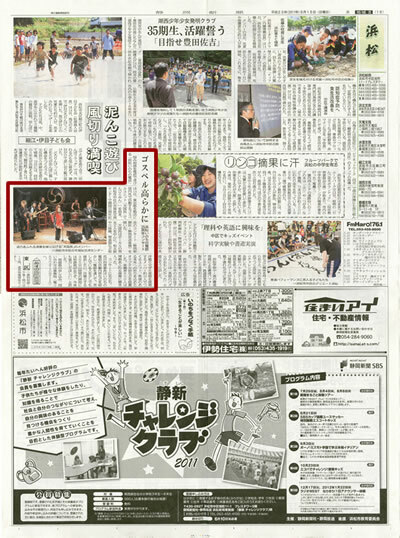 Shinto officials had attended our concert held in Rikuzen-Takata on August 15th and they approached us asking to be a part of the feast. It is the very first historical event that Gospel group will partake a traditional Shinto feast as means of worship and offering to God in the form of Shintoism. 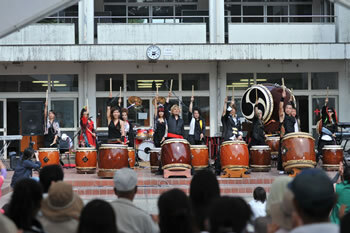 the music group suitable for the sacred feast which has a long history by the local Shinto Shrine. This is going to be a great event, and we are really looking forward to sharing the Gospel message with all those attending. 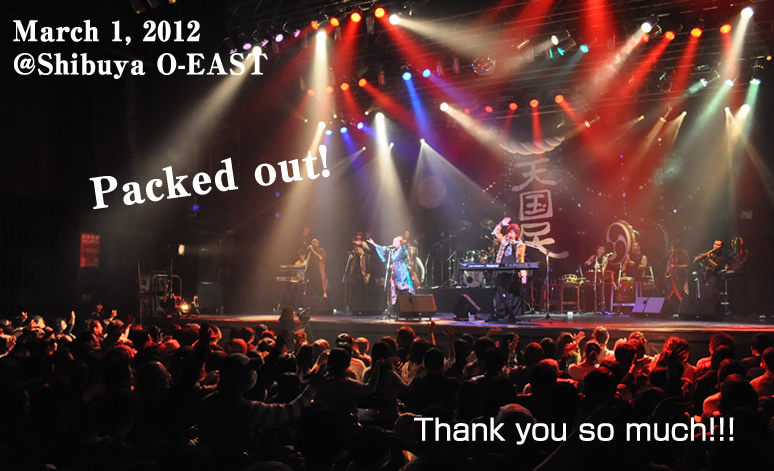 Many people showed up and really seemed to enjoy our performance. Some of the people showed their appreciation with tears in their eyes saying " your music brought us joy of life even though everything was taken away by the Tsunami." Others said " Your words have encouraged me" So many of them showed their appreciation for our effort but in reality we are the one who should appreciate them for showing us such a wonderful example of being so persevering in great tribulation. 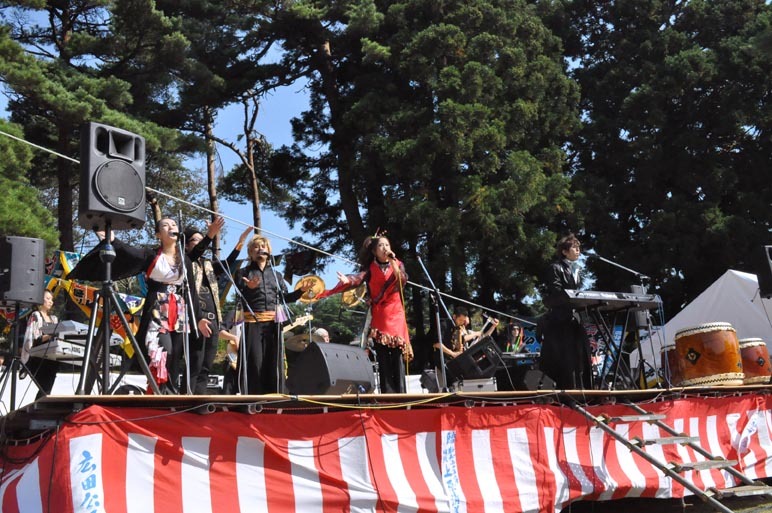 Our local community, Sengawa, had a summer festival August 3rd, and it featured Heavenese. 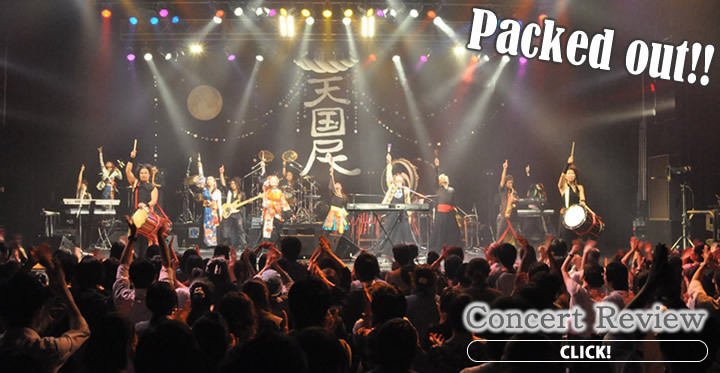 For th last 6 years, Heavenese has performed at the main venue of this festival which due to the stage size limited their performance. 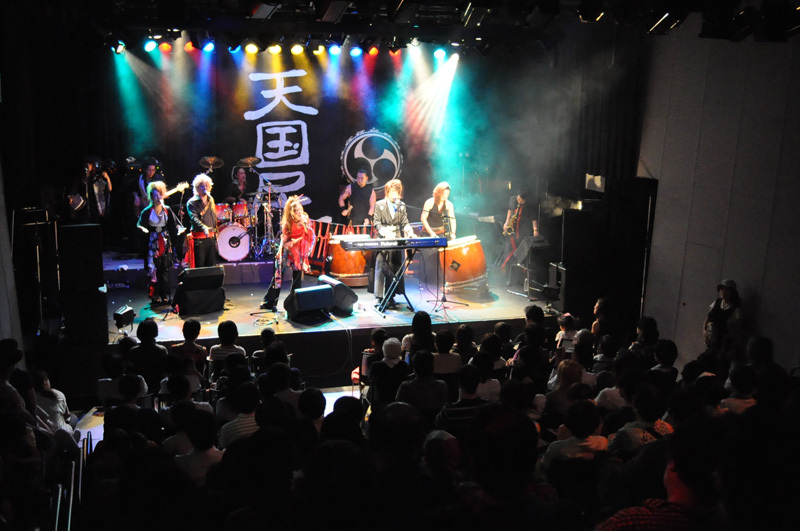 However, this year they were featured at a secondary venue, Sengawa Theater, which enabled them to do their full show. 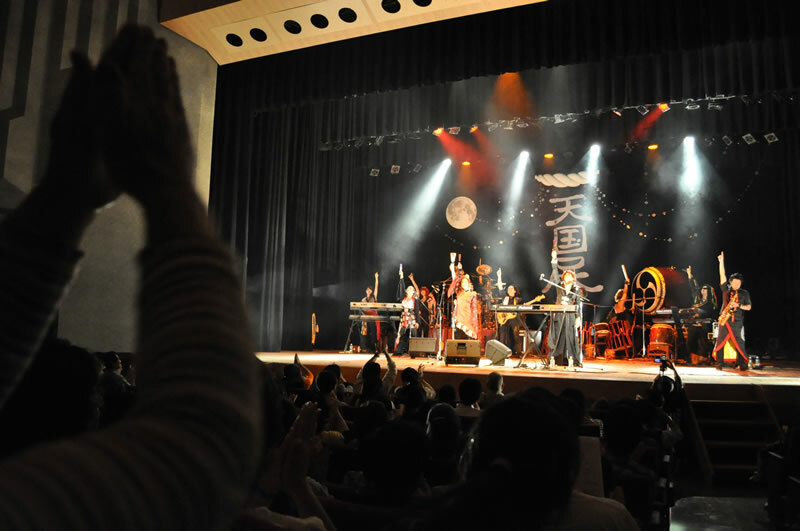 Sengawa Theater was filled to capacity with local people. 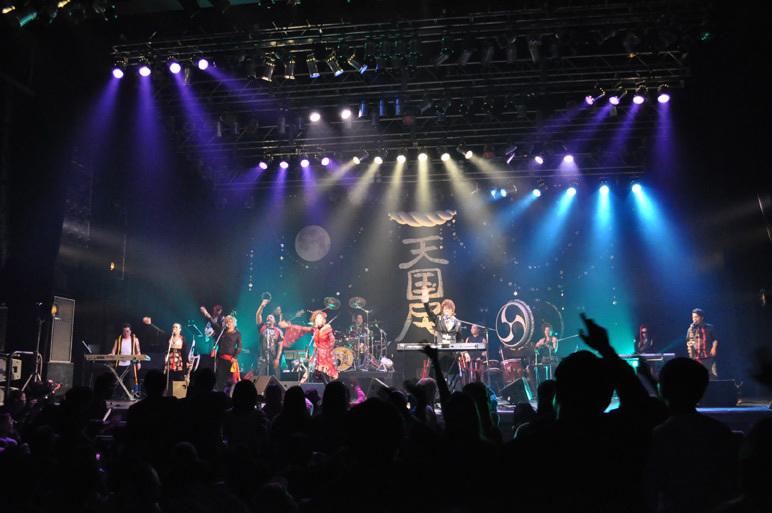 Although it was the first time ever for the HEAVENESE band to perform in its "Yamatodamashii" style, with Japanese taiko drums and shamisen, outside of Tokyo, the venue was packed with people of all ages, from small children to elderly people. It was quite a sight to see the whole audience stand and sing "halellujah chorus"
The event was reported in the local newspaper as well. 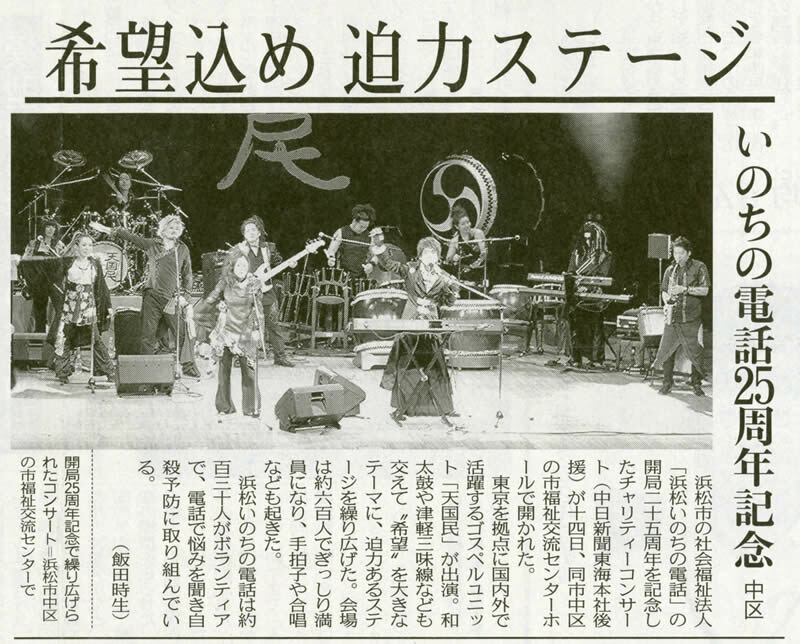 We thank all those who came to the concert to support our work in the affected areas. 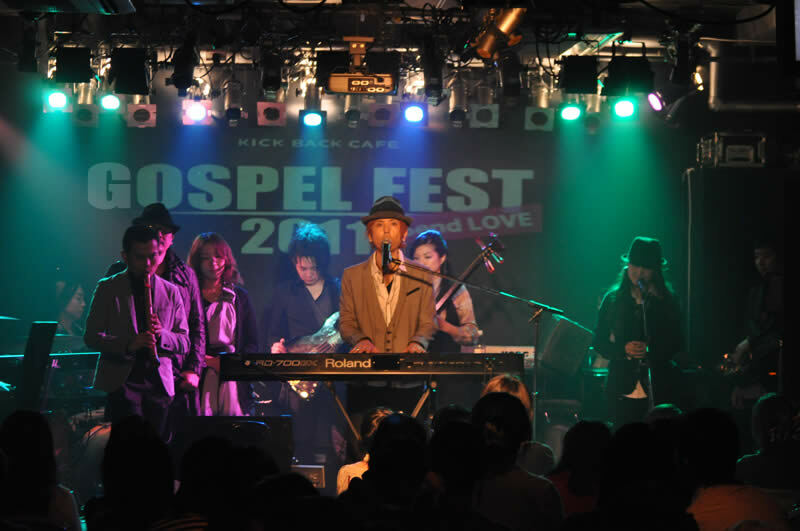 held the "Gospel Fest--Don't forget Kobe" charity concert for the victims of Kobe earthquake in 1995. 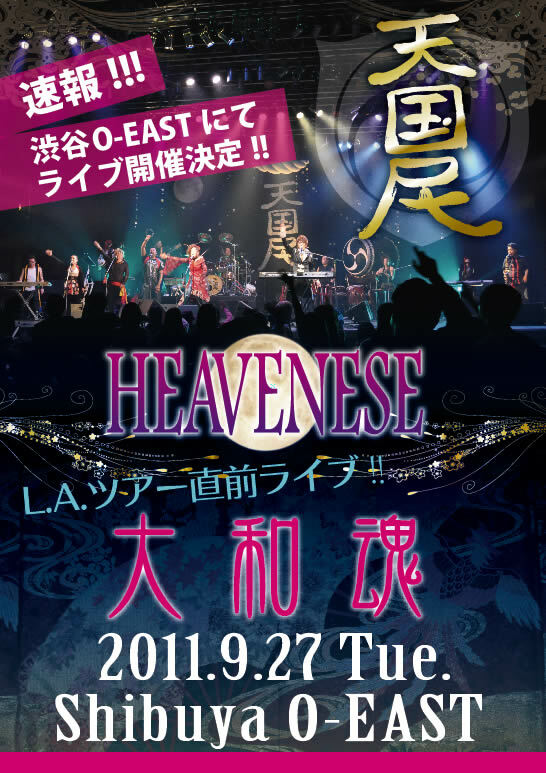 ● Check out the video clip of HEAVENESE LIVE concert in Shibuya, Tokyo!